You may think of riding a San Francisco's cable car as a city "sight" rather than as transportation. Most people do, and who wouldn't? They're cute and old-fashioned in the best kind of way. If you just say "I'm going to ride a cable car" and charge off to do that, unexpected hassles can turn your fun adventure into an annoying one. If you show up at the busiest boarding areas, you could be standing in line so long that you start wondering if you need to file a change of address form. Getting on a cable car mid-route can be confusing - and asking them to stop isn't obvious, either. This guide will help you enjoy your cable car ride with a minimum of fuss, disappointment, and aggravation. Each cable car has a staff of two. The conductor sells tickets and looks after the passengers. The grip person runs the car, connecting it to the cable to move and disconnecting before applying the brakes. The way they work is almost as interesting as the ride itself. Cable cars start and stop by grabbing or releasing a moving cable that runs continuously underneath the street. The grip uses levers and handles to make that happen. To stop, they also put on the brakes (a big piece of wood that drags the ground). The hard part of the job is to do it all smoothly. And along with all that, the grip person is also the bell-ringer, signaling the car's approach. Some of them do that with lots of flair. Three cable car lines run through San Francisco. The map above shows their routes. If you want to get to a specific place, the map will help you choose the right line, but if you're just riding for fun, it may not matter much. The Powell-Hyde and Powell-Mason lines take off from the same hub near Union Square. Check the signs on the cars to be sure you get on the one you intended to. The Powell-Hyde line runs precisely where you'd expect from its name, from the corner of Powell and Market Streets to the end of Hyde at the waterfront near Ghirardelli Square. For maximum fun, take it from Union Square to the top of Lombard Street, get off there and walk down the "crooked" street and then it's just a few blocks to the waterfront. Going from the waterfront to Union Square, the Powell-Hyde boarding area can be super-busy with long lines. You may get on a car faster by walking a few blocks over to the intersection of Taylor and North Point streets to catch the Powell-Mason line instead. This route also starts near Union Square at Powell and Market Streets, in the same place as the Powell-Hyde Line. If you're headed to Union Square from the waterfront on the cable car, the boarding area for this line is less busy than the one over at Hyde Street. If all you want to do is say you rode a cable car, this is the one. It's the least busy of the three. It's also full of thrills as it makes one of the steepest hill climbs in the cable car system from California and Market to the top of Nob Hill, then back down to Van Ness. You can get off at California and Taylor, explore the surrounding Nob Hill area and walk from there to Chinatown or down to Union Square. Everyone who is older than the age of four needs a ticket to ride the cable car. Check current fares and how to pay on the SFMTA website. Your payment is good for only one ride. If you get off for any reason, you'll pay again. You can buy single-ride tickets from the conductor on the cable car. Have small bills available if you plan to do that. Visitor Passports are available that allow unlimited cable car rides as well as the Market Street F-Line streetcar and all the city-run buses. You can get a paper pass or use the MuniMobile app. You can also get tickets and passes from machines or attended booths, which are located at Powell and Market (near Union Square) and Hyde at Beach (just below Ghirardelli Square). If you buy a San Francisco CityPass to get better prices on other attractions, it includes a MUNI passport. If you find a long line when you arrive at the cable car stop, save time by sending one person to buy tickets while the rest of your group gets in line. The physical part of boarding is easy. Just step up, and you're on. Figuring out how to get a cable car to pick you up as it rattles past is harder unless you know how. Anywhere along the cable car lines, look for a sign like the one above and wait on the curb next. While you're waiting, check the sign to make sure the car you're boarding is going to your destination. The sign above says it's going to Bay and Taylor. To let the grip person know you want to board, wave as soon as you see the car approaching. For safety, stay on the curb until it stops. After the car stops, walk out to it, making sure there aren't any approaching automobiles. If the cable car is completely full (and it can sometimes be jam-packed for several stops after it leaves the end of a line), it won't stop no matter how much you wave or yell. If there's no room, there's just no room. If several of them pass you, all too full to stop, it may be time to re-evaluate your plans. Where to Ride: In Or Out? The people riding on the outside of this cable car can see everything and feel the wind in their hair. The folks sitting just behind them still get a pleasant experience, but they have to peek around the hangers-on. Sometimes, so many people stand on the outside that seated passengers may not see much. To see the grip person in action, step inside. They work between the rows of benches at the back. For safety, you'll have to stay clear of their workspace and inside the marked passenger area. Inside the car (where the windows are), you'll see a little bit out of the windows if you stand. If you sit down in a crowded car, all you'll see are the hip pockets of your fellow passengers standing in front of you. If you're riding the cable car for the fun of the experience, choose the seating that suits you best. One of the best spots to see it all is just behind the grip where you can still see out and also watch them work. Getting off a cable car sounds easy, doesn't it? You just step down, and it's done. If you're riding to the end of the line, that's all you'll have to worry about. If you want to get off somewhere along the way - maybe in Chinatown or North Beach - you'll have to let the grip person and conductor know about that. The obvious thing to do may not be what you think. 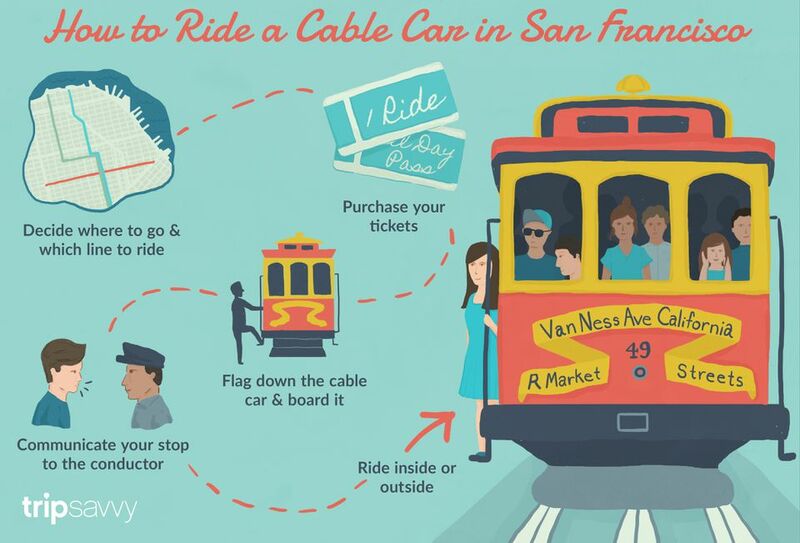 On other transit systems, pulling an overhead cord says you want to get off, but that isn't the case on the cable car. In fact, the white cord you see in the photo above isn't for you - it rings the cable car's bell. To ask for a stop, use the old-fashioned method instead: Just say so. The typical way to do that is to say "Next stop, please," speaking loud enough for the conductor or grip to hear you. Cable cars take a little while to come to a halt. Signal at least a half block ahead of time, or you might have to wait until the next stop. What Are the Best Attractions to Visit in San Francisco?